Handmade in Haiti from recycled metal oil drums, this gecko is 13 inches long and handpainted with a colorful design. 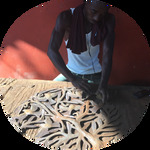 Founded in 1990 by a multinational group of young entrepreneurs, Caribbean Craft - formerly known as Drexco - promotes employment in Haiti by training unskilled - but often highly gifted - craftspeople in metal art, and by assisting the independent artisans through the introduction of new designs and new market outlets. Unemployment in Haiti, the poorest country of the American hemisphere, is variously estimated at 60 and 80%. Handmade in Haiti from recycled metal oil drums, this gecko is 13 inches long and handpainted with a colorful design. Hook on back for hanging. Detailed Comments: Love these oil drum art. sorry they arent restocking.